Flash Flooding – A sign of the Future? 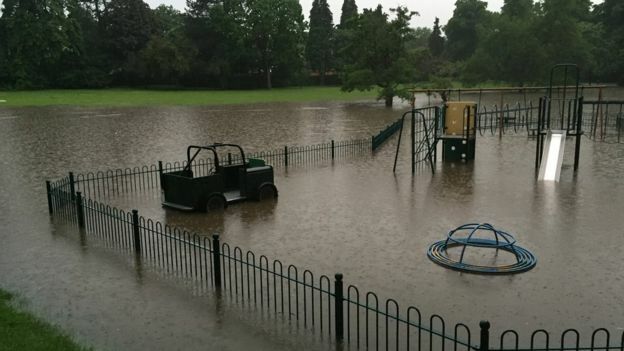 The recent floods that hit the West Midlands are a timely reminder of the impact of extreme weather on our daily lives. Torrential rain and flash floods are no longer a rare occurrence in this country but are starting to become the norm. Climate change is altering our weather patterns to an extent that scientists and meteorologists can’t predict accurately what weather will hit us in the future. With that in mind, preventative measures in dealing with flooding become even more important. Research and development in this area is crucial. The ability to forecast floods, maintain defences and create incident reports are important but we have seen in a reduction of 62% funding into this area by the Department of Environment, Food and rural affairs. Since the Environment agency has stated we need a complete rethink in our approach to flood defences, it seems short sighted to reduce this funding. The last two years has seen major flooding take place in major cities and towns all across the UK, particularly places like York and Tewkesbury who have major rivers running through them and little ground to soak up the excessive water. As we continue to develop over larger areas of our cities and towns, we reduce the opportunities to drain the flood water and our internal drainage systems aren’t robust enough to cope with excessive waters. It isn’t just cities and towns that are affected. If you travel up and down the country after major rainfalls, you will see large areas of countryside and farmland covered in large pools of waters. Sometimes this is down to pure saturation with the ground unable to cope with heavy rainfall. But other times, it is due to soil compaction where the soil quality has been affected, preventing it from soaking the water up. We can’t assume that the countryside wouldn’t be affected by heavy rainfall and floods because the rain will simply drain away. Complicating matters is how much groundwater there is in those affected areas and if this is high, this also prevents drainage. Our freshwater ecosystems are rich in biodiversity and play an important role in the provision of fresh water for ourselves and our flood defences. These ecosystems can cope with varying weather patterns and can also adjust itself. However with more and more extreme weather conditions, even these systems can’t cope and are being altered beyond repair. There have been various plants and molluscs that live in our rivers and soak up pollution but these have swept clear by the floods. While we concentrate our efforts on our own living areas, we should not forget the damage is being done elsewhere and the knock on effect it will have on our lives. What can we do? Stop tarmacing over the ground to park cars in Birmingham. We need to understand and implement firm surfaces that are permeable, or feed water to holding ponds and ditches which can soak it up. Let’s have green car parks, and front gardens that are not paved over.